Located on beautiful Lake Mendota, the Mendota Civic Center serves guests within the north central Illinois region. Our guests have come to depend upon the accommodating, professional and consistent services offered by the Mendota Civic Center staff. 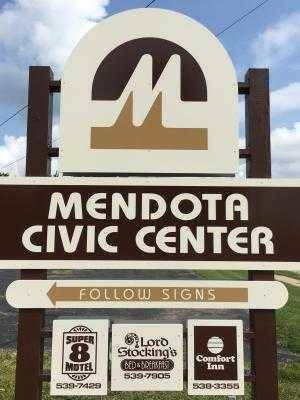 Since its grand opening in March 1988, the Mendota Civic Center has become a leader in event planning, striving to provide the perfect guest experience. This beautifully structured facility is conveniently located on Illinois Route 251, on the north edge of Mendota. Set to the north of Lake Mendota, accented with trees, a wedding pergola and a landscaped patio, the textured block resembles a familiar Frank Lloyd Wright design. The parking lot provides over 150 parking spaces, including handicap parking. The building is handicap accessible and spans over 17,000 square feet. Five main areas are available for use. The Pergola will accommodate an unlimited number of guests, both seated and standing, creating the perfect ceremony and photo op site. The Grand Ballroom will accommodate from 50 to 400 guests, depending upon the seating arrangement. For smaller gatherings, the Feik will readily host 80 to 100 guests. The Mission Room will offer your guests comfort in a setting from 10 to 40. When planning a small event, the Illinois Room will provide seating from 4 to 24 guests. The Mendota Civic Center staff will assist you in choosing the room and design that best suits your needs.